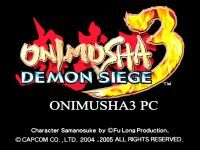 The phenomenally successful world of Onimusha continues with its greatest chapter yet. Internationally acclaimed film star Jean Reno (Leon, Mission: Impossible, Ronin) plays Jacques Blanc, a French cop caught in the middle of an horrific attack upon Paris. Takeshi Kaneshiro returns as Akeshi Samanosuke, the original Onimusha warrior who continues his campaign against his arch enemy, the evil Nobunaga. Together, they embark upon an epic adventure that will take them on a journey spanning 500 years. Can they break Nobunaga's demonic dominion and ultimately crush his evil ambition once and for all?